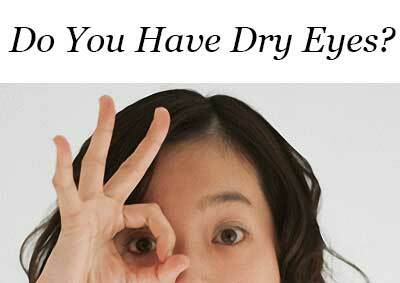 There is an estimated 40 million people worldwide suffering from dry eyes. Symptoms include fatigue and dryness of the eyes, itching, eye redness, blurry vision, sensitivity to light, and increased eye irritation from smoke or wind. Visual acuity test is the most common procedure to measure the clarity or sharpness of a person's vision, or to help optimally configure a pair of eyeglasses to correct eye refractive errors such as myopia, hyperopia, and astigmatism. An eye chart called Snellen chart is typically used by eye specialists to measure visual acuity. However, standard measures of visual acuity testing (such as Snellen chart), is not precise enough in measuring visual acuity in real time or when measuring a person's visual performance in real life situations such as driving, reading, and computer work. That is why this conventional acuity test cannot identify dry eyes. In fact, many people who undergo regular vision test show no signs of problems, even though they are experiencing poor or blurry vision when doing their everyday tasks. So how can we identify the problem? Look at the chart below. This is called "Landolt C". It is also known as "Japanese Vision Test". 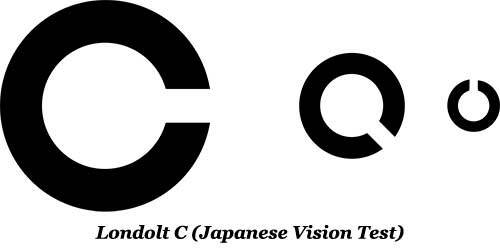 The Landolt C looks like a ring with a gap making it similar to letter C. It comes with various sizes and orientations. 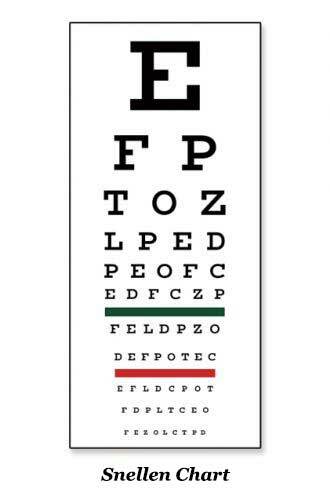 Just like the Snellen chart, the purpose of this test is to measure visual acuity and the patient's task is to identify on which side the gap is. However, this time, we'll be using a latest device, which makes use of Landolt C, but can more accurately measure a person's visual performance in real time (within 1 minute). This is called Inter-blink Interval Visual Acuity Decay (IVAD) test. 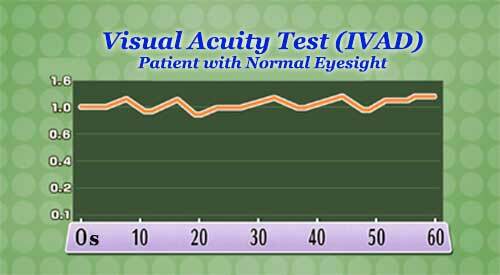 The above chart shows the result of a healthy person's visual acuity test (IVAD) within the 1 minute duration. It shows that the patient has an average visual acuity value of 1.0 or 20/20, which is considered "normal" vision. 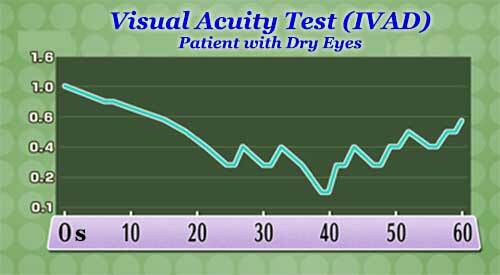 The above chart shows the result of a dry-eye patient's visual acuity test that dropped significantly after 40 seconds, which is showing a value of less than 0.2 or a whopping 20/125 vision! In this result, the patient has an average of 0.4 visual acuity value, or a 20/50 vision. Normally, you won't see this kind of result if you only perform a regular visual acuity test like the Snellen chart. Why would the visual acuity value decrease so much on dry-eye patients? Well, the Inter-blink Interval Visual Acuity Decay (IVAD) test, as the name implies, measures the patient's visual acuity by gauging how vision decreases between blinks over time. Studies show that dry-eye patients lose vision faster between blinks than patients without dry eye. Yes, degradation of vision can be caused by uneven tears. Normally, when you blink your eye, your tears spread on the surface of your eye uniformly and smoothly. With this, you'll be able to see things clearly since the outer layer of your eye surface has no uneven spots. However, a person who has dry eyes has a bumpy eye surface even after blinking. By this, the light entering the eye is scattered, and you'll end up having a blurry vision. This condition is widely known as "Dry Eyes". Mucin (mucous) is a sticky substance that acts as a lubricant of the eye. 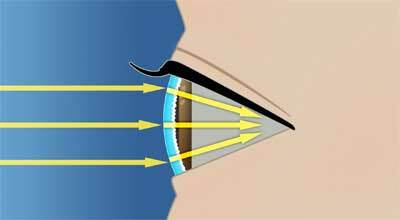 Its main job is to smooth out the uneven spots on the eye surface. 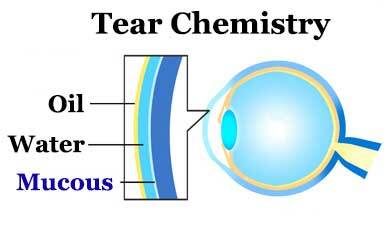 However, for some reason, as we grow older, not only the amount of tears but the amount of mucin will decrease and dry spots will form along the surface of the eye. 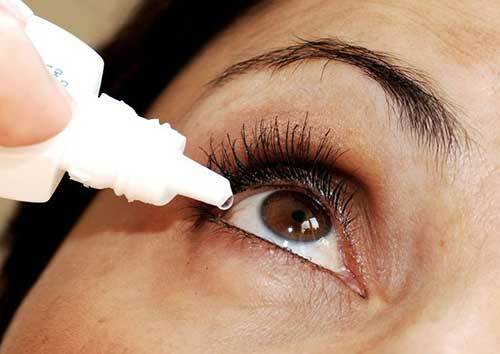 Are There New Eye Drops Available to Treat Dry Eyes? Although artificial tear drops are widely available over the counter, they only act as lubricants and do not solve mucin deficiency. Two types of eye drops, namely Rebamipide and Diquafosol, are new treatments currently being developed in Japan for dry eyes caused by mucin deficiency. These eye drops stimulate mucin secretion and increase lipid secretion as well. They are not yet commercially available but clinical trials prove to be very promising.